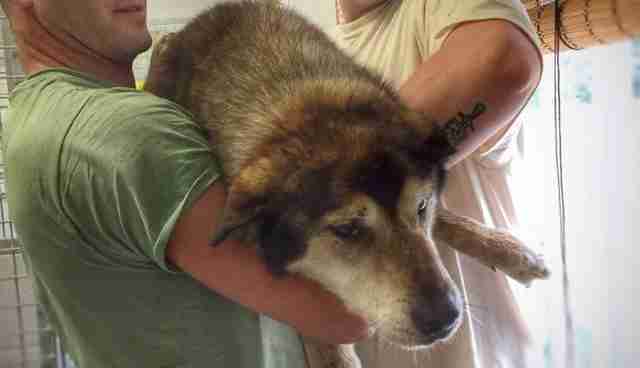 Frightened and alone with no help in sight, the world nearly came to an end for a sweet old dog named Rocky. But even in the darkness of his sad isolation, rays of hope found their way through. And they carried him home. 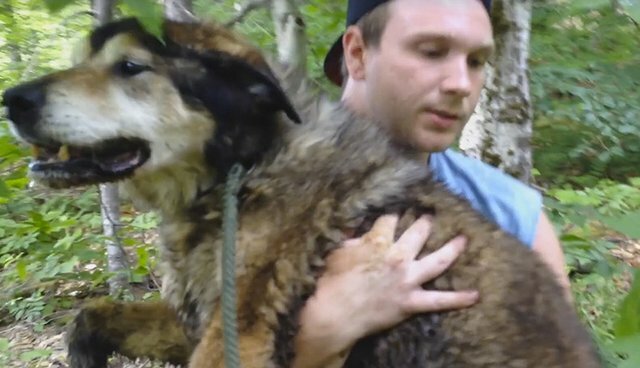 Earlier this week, logger Jake Higgins had spotted the dog wandering by himself while working in a remote stretch of forest near Conway, New Hampshire. Fearing the pet had been abandoned, Higgins alerted the Conway Area Humane Society for help. On Thursday, the shelter's operations manager Debra Cameron travelled with volunteer Kevin Ahearn to meet up with Higgins so he could lead them to where he thought the dog might be. "Thankfully, Jake knew the trail he had seen him taking and brought us right to it," Cameron told The Dodo. "We just happened to get there in time to see a flash of the dog's tail before he headed down a slope." It didn't take long for the group to catch up to the dog; not only was he an older dog, he was clearly on his last leg. When they whistled to him, he just sat down exhausted and waited for them to approach. "He was as sweet as a pup can be," said Cameron. She captured this video of their rescue efforts, including the dog being carried happily out of the woods and to the safety of the animal shelter. What wasn't known at the time was how long he'd been there, or how he came to be so lost in the first place - but the story doesn't end here. Within an hour of posting the footage above on the Conway Area Humane Society's Facebook page, Rocky's mysterious story began to unravel when a family friend of his owner recognized him. It turns out, the 17-year-old dog had run away from home over Independence Day weekend, sent into a panic by the sounds of fireworks going off in the neighborhood where he lives. To Rocky, and many pets like him, those noises must sound like the world is coming to an end - so he sought refuge in the forest to hide away from it all. But Rocky hadn't been forgotten. Every day since he'd gone missing, his owner had been searching for him, not realizing he'd ended up miles away. 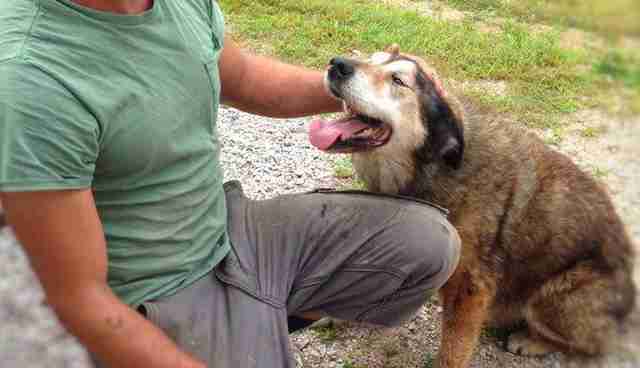 "Rocky is 17 years old and has cancer, he is loved and very missed," the shelter wrote. On Friday, he and his dad were reunited. "They were so grateful," said Cameron. "Rocky's dad is a very nice man. He gave us a $100 donation when picking him up this morning. He has helped other people locally search for lost pets and is an avid dog lover. It was such a relief to learn Rocky was his and such a loved pet." Thanks to the dedication of those rescuers who worked so hard to help, Rocky's story has the happiest of endings - though it could have easily ended in tragedy. Cameron recommends dog owners ask their neighbors to warn them before lighting off fireworks, so pets can be secured indoors. "Fireworks are so rough on pets," she said, "even for a seasoned old boy like Rocky."